DDPS innovative technology combines the filter and dryer into a single unit, reducing product handling, contamination and capital cost. The filter/dryer performs a multitude of tasks including filtration, displacement or reslurry washing, vacuum or convection drying. It can discharge wet cake, slurry, liquid, or dried cake to less than 0.1% moisture. Our range of filters and filter-dryers provides optimum performance and flexibility for demanding pilot, small-scale, and full production operations that require high efficiency in washing and isolating solids. The side discharge valve is ideal for applications that involve multi-purpose production with frequent product changes or processes with stringent requirements for low-particle and sterile production. Agitator - Unique, 3-arm "S" blade is designed for low speed and high torque service for processing thick, wet or dry cakes. Angled and profiled blades for axial and radial mixing of soil. the tip speed is gentle of the crystals and eliminates the concern for shearing or crystal damage. Side Discharge Valve - This patented design features a metal-to-metal seals, eliminating the cleanability issues that can arise with the use of o-rings. The valve is FDA validated and will provide a pressure/vacuum-tight seal. Heated Filter Plate - The all-welded design provides heat energy directly into the cake from the underside, allowing for heat transfer through all of the filter contact surfaces, for more efficient drying. Controls - Our in-house controls engineers design both manual controls and more sophisticated PLC-based controls with both local and remote stations for pilot units. Vessel Design - DDPS provides strict and rigid pharmaceutical vessel specifications. The Agitated Filter is a closed vessel designed to separate solid and liquid by filtration under pressure or vacuum. The closed operation ensures odorless, contamination-free and nonpolluting working conditions maintaining product purity and hygiene. The advanced technology of agitation and hydraulics used in the equipment makes it versatile and user friendly. The resulting wet cake can be reslurried and washed thoroughly with water or solvents unlike in “Nutsche” type filters or centrifuges. Functionally safe and easy to operate, the agitated filter can carry out various phases of process operations including crystallization, filtration, extraction, decoloration, washing and drying. The agitated nutsche filter/filter-dryer has a wide field of application in Chemical, Pharmaceutical, Agro Chemicals, Fine Chemicals and Food Industries. 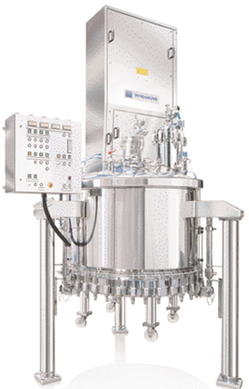 Sterilizable pharma versions are available for aseptic requirements. Clockwise rotation: smoothing and compacting cake surface during filtration. Counterclockwise rotation: stirring to prevent sedimentation near filter media, reslurrying while washing and automated discharging. Downward movement: Assisting squeezing and discharging. Hydraulic Power Pack - for discharge valve operation and lowering/lifting of the agitator and detachable bottom. Spray pipe/washing nozzles - provided inside the vessel for efficient washing of the wet cake and cleaning the vessel. Control panel - ergonomically placed on the machine, housing all controls. One person can effectively monitor and control the entire process. Toxic and hazardous material can be processed. Product can be washed thoroughly and economically with solvents. Blending of product possible before discharging. Large quantities can be processed faster than the conventional systems. Higher cake thickness possible in the equipment for crystalline products. Range of MOCs and also clad or polymer-lined construction - Stainless Steel and Hastelloy (C276, C-22 and C-2000), Rubber, PVDF and Teflon lined. All welded construction or bottom section trolley mounted and detachable.